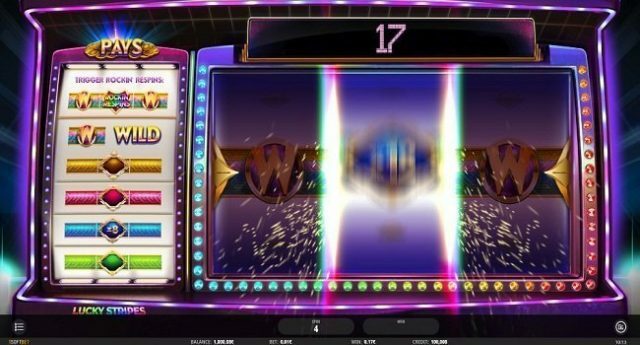 Lucky Stripes is a new online slot from the house of isoftbet gaming playable across every single device including Android or iOS, tablets and personal computers. Total reels for this Lucky Stripes slot are 3 and paylines are just 1. It means a player will have to match or land a line of 3 matching colour symbols to win during his play. Coin range for the game starts from 1p and £1 per spin and there is a jackpot of 150 times of your stake. Lucky Stripes is a very unorthodox slot game, where matching symbols or matching wilds will get you big wins. The game features a wild symbol that can replace other symbols of a winning combination. The game has only 1 feature known as the Rockin’ Respins feature. This feature is triggered when you land the Rockin’ Respins logo on reel 2 and wild symbols on reel 1 and 3 and. If you land ‘wild’ on reel 1 and 3 then the reel 2 will spin again. This middle reel could end up with a blank or a variety of multipliers and prizes, which could get you up to 100 times of your stake. The respin will continues until you get something on that reel. Lucky Stripes slot is a unique online slot that can get you good amount of money. This looks clean and impressive on computer as well as on mobile phones. If you are looking to play this slot then you should stick with isoftbet online casino.